As I have said many times before March is my worse month for catching fish. And that fact remains but for a few outings last week. We finally got a break in the weather and temps got to 60. 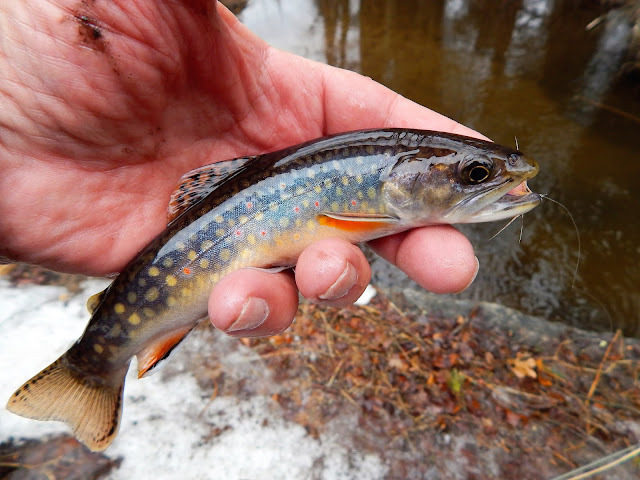 The snow melted which brought up the streams and got the trout moving and feeding. The now melt caused the streams to run somewhat off color which I think were to my advantage. Hidden among hemlock and pine this little blue line had some hungry brook trout. This guy wasted no time jumping at my offering. It's these tributaries that hold some beautiful trout. The trout run up and back down at will. It is at these junctions where one might encounter brook trout. 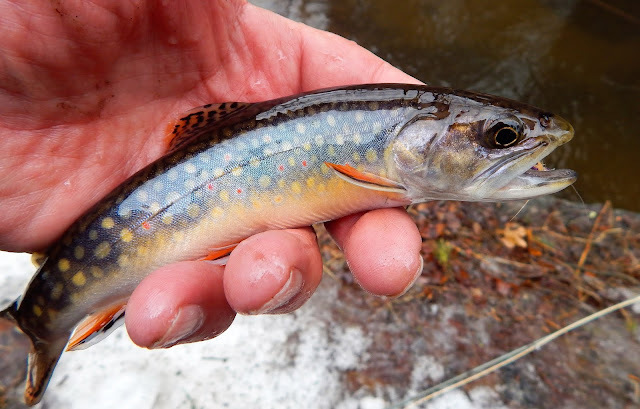 Brook trout plus..........equal wild Tiger trout. I took several strikes along this riffle. This guy was the catch of the day. A strong one that has been in this stream for some time. 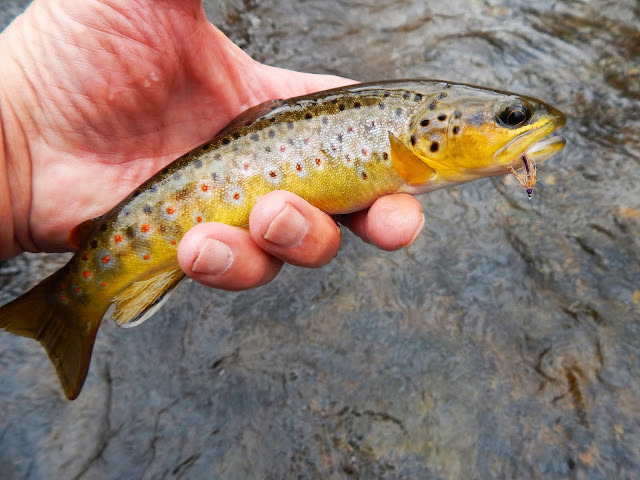 With browns like this along with the increase of wild brookies in a stream dominated by wild browns leads me to believe this stream may have a few Tigers start to show up. Oh yeah! Happy days are here again. Bill I think they're here and the long range weather calls for them to stay. Thank you, Alan. As I look out the window it's snowing again, but you always give me hope! Mike you have to fed up with winter about now. I know that folks like you enjoy it, but the winters of northern Maine are quite the test. I may pay a visit to the Pine Tree state in the next few weeks. Stick to the coast! We're closing in on 180" of snow up top. Mike the coast it shall be....180" oh man. Awesome looking water and a fun trip afield to catch both wild browns and brookies! Will that stream has been a brown trout stronghold. Over the last 2 years more and more brookies have been showing up. Now they are smaller than the browns, there has to be a few biggies somewhere. Another nice trip through the North Woods. The fact that you caught fish only adds to the fun of the trip. Mark the actual "North Woods" are about 400 miles further north. Our woods are a bit more warmer. And a fish on the line makes it super day. What a great day, Alan! Those trout look plump and healthy. I have to believe all the precipitation we've had since last summer has washed plenty of food into the creeks and the trout are eating pretty well. Sam it was a day in March I'll not forget. Had a day similar yesterday. Fish are doing fine, should be a great spring. John, that is a big boy. I hope you enjoy your time with the your new grandson. Starting to fish here in the Driftless again too. Went out with a friend yesterday. The water was moving fast but only lightly stained and the temps got up into the low 50's. Great day to be alive. David with your temps moving into the magic 50's your fishing will improve. These days are what we deserve after cold winters. P.S. This past week has been a wreck we were moving and still unpacking boxes as of today!!! Bill you'll find some awesome scenery and trout in the Smokey's. I don't envy that madness of moving. Especillay at our age.